Launch Your Real Estate Broker, Office, or Team Today! 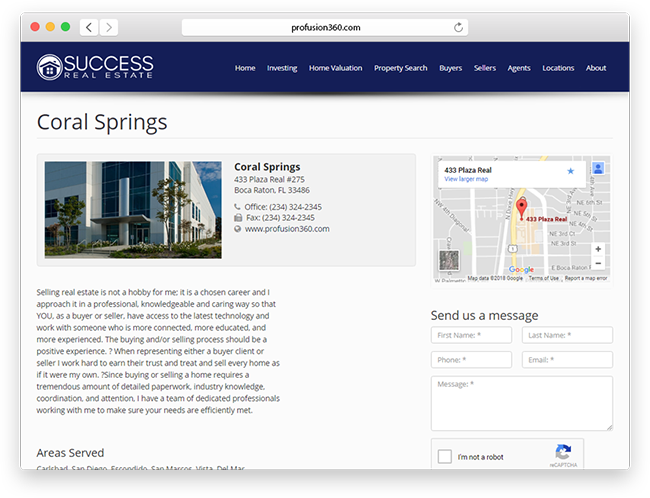 Our Office solution is perfect for small to medium sized real estate offices, brokers, or teams needing a real estate website and marketing platform. Our office solution is completely scaleable, so as your real estate business grows, our office platform will continue to support you. It includes a Semi-Custom Office Website and our Office Marketing Platform that includes Broker Control Panel, Office CRM, Lead Routing, Agent Accounts, Listing Marketing, Team Management, and much more. Our optional Showing Feedback System allows all your agents to obtain showing feedback from their listings. If you are a real estate team or office, then our Team/Office solution is perfect for you. 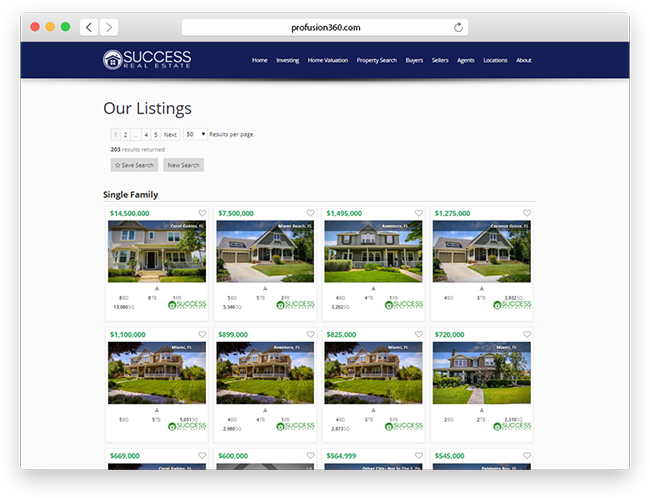 Our Team & Office solution adds valuable team features to your real estate website. Office IDX gives you the features you need as an office or broker. With Office IDX, you’ll be able to promote and highlight all of your office listings on your broker website. Office IDX will give you advanced lead routing, and the ability to display featured listings with property search on each agent’s profile page. 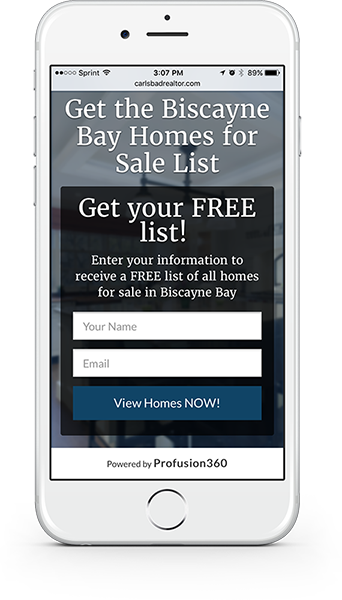 In addition, all of your office listings will be synced within your Profusion360 account so you can take advantage of our listing marketing and real estate landing pages. 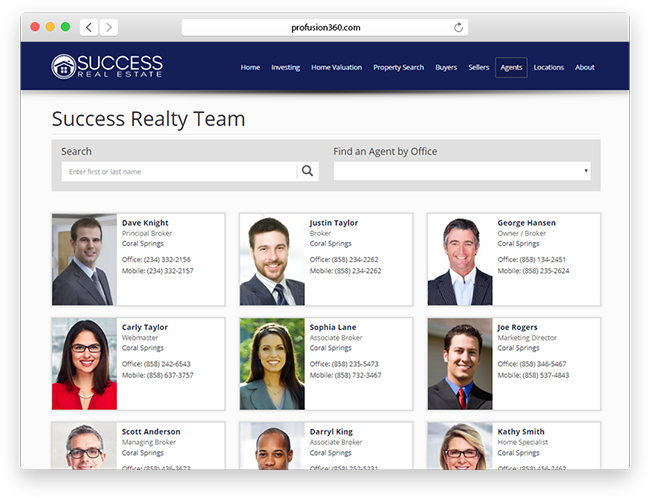 The Team & Office solution adds an agent and team directory to your real estate website that displays their photo and contact information. Your website visitors can utilize the agent search feature or filter by office to locate an agent. 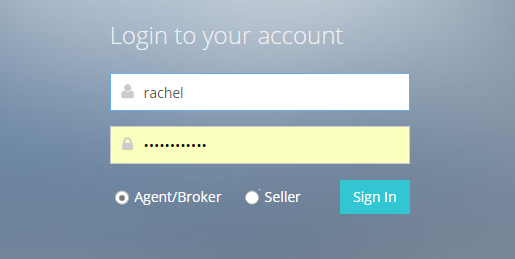 Your team members are easily managed through our Broker Control Panel. Each agent in your broker/office will get an agent profile page on the office or broker website. The agent profile page is automatically created for each agent and includes photo, agent profile, contact information, social media profiles, and office location. Each agent will get their own lead capturing form so they can drive traffic to their agent profile page to capture leads. The leads are captured with our integrated CRM system where the agent can manage and nurture their leads. 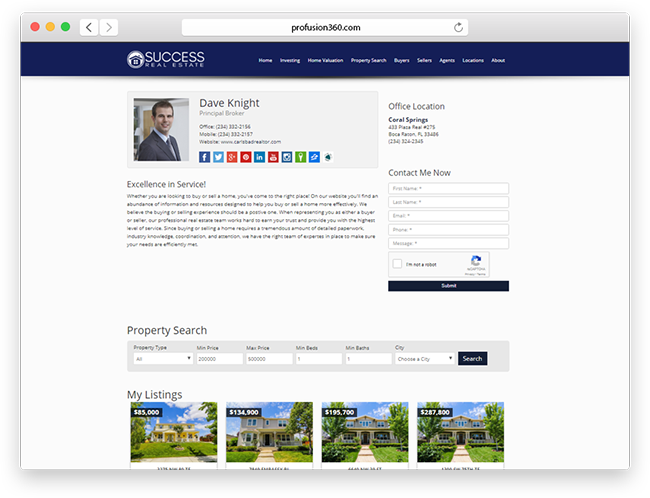 The agent profile page will also display the agent’s listings automatically and includes a property search form allowing their clients to search for homes right from their agent profile page. If you have multiple real estate offices, your office website may include an office directory displaying all your locations. Our real estate office solution is scaleable and can support your growing real estate business. Each office location will have an office details page that includes the photo, office information, location, and contact information. You may also include any additional information about the office such as Areas Served and Languages. A map is included along with a lead capturing form integrated with our CRM system to ensure all leads are captured. Office locations are easily managed through our Broker Control Panel. Our office solution includes a blogging platform that allows you to easily post blogs to your office website. On top of all the features in our real estate CRM system, our Office Solution includes additional office and broker features that will allow you to oversee and manage leads from all your real estate agents. Our office and broker solution includes a Broker Control Panel allowing you to oversee the status of all leads from all of your real estate agents. With a master view, you’ll see the status, actions and follow-ups of all leads of your agents including lead status, lead rating, contact log, notes, tasks, and more. This will give you the necessary tool to make sure no lead is forgotten and every lead is being followed-up properly by your agents. 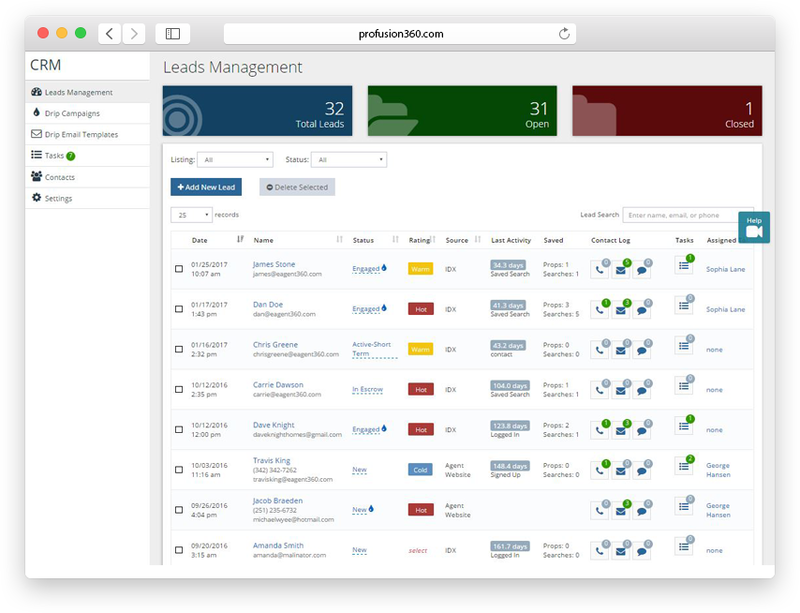 Our office solution includes lead routing enabling you to be more efficient and ensure no lead is left behind. 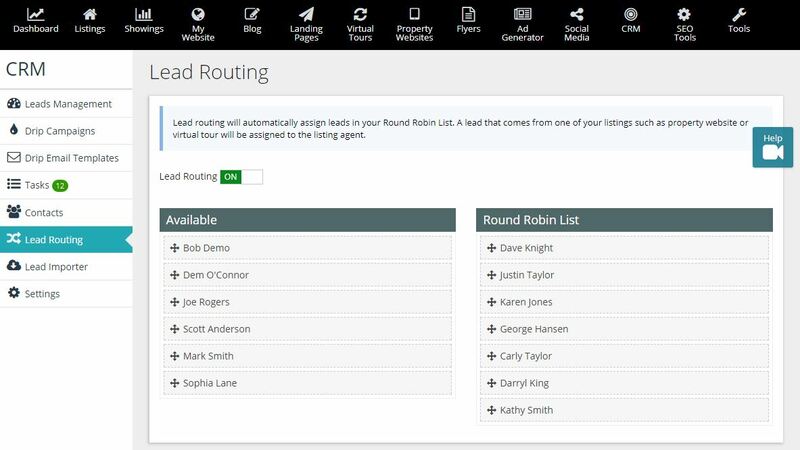 As your leads come in from your broker website, they can be automatically routed to your real estate agents in a defined round robin group so they are evenly distributed. With advanced lead routing, you can route leads to specific group of agents based on price, location, and just about any other parameter. Our real estate office solution also gives you the ability to assign leads manually. This will give you control on which real estate agent is best suited to close each lead. 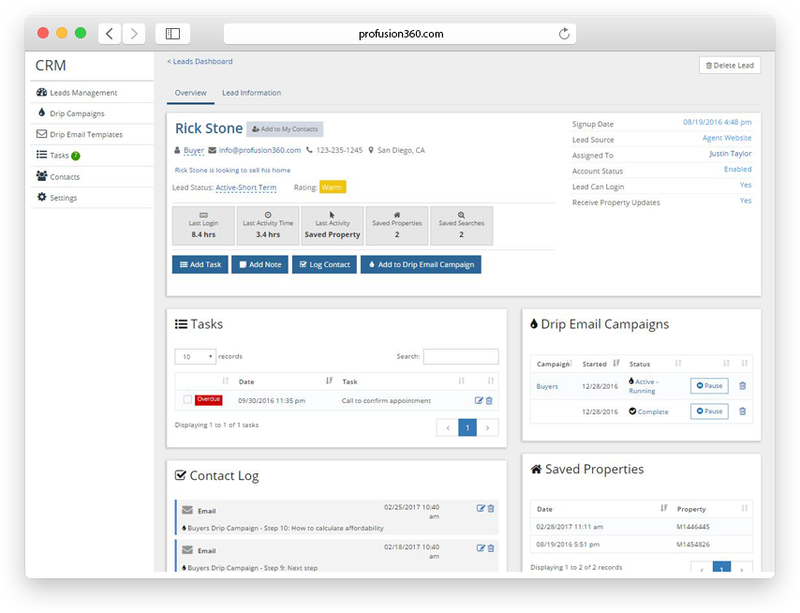 Our office solution gives you our team drip email marketing functionality. The broker can create standard company-wide drip email campaigns to be used by all real estate agents. The agents will then have access to these drip email campaigns within their agent accounts and can apply them to their leads for nurturing. Our office solution platform includes separate logins for your real estate agents.Your real estate agents will only see their listings and leads and can manage their own profile. Your agents can then manage their own listings leads and utilize our integrated listing marketing engine. Along with each of your real estate agents having their own agent account login, they’ll have their own CRM system to manage and nurture their own leads. Your real estate agents will only see the leads they’ve been assigned to. They can then utilize our CRM lead management tools such as lead status, lead rating, deals, tasks, contact log, and notes. Within the Broker Control Panel, you will see all of your agent’s leads so you know the status and what follow-up actions your agents have taken. Your agents will have access to drip email marketing and any company-wide drip campaigns you have defined. With a full-featured CRM system and drip email, your real estate agents will be able to take leads, manage them more effectively, and close them. Each of your agents can manage their own listings and have access to our Listing Marketing engine allowing them to market their listings better. 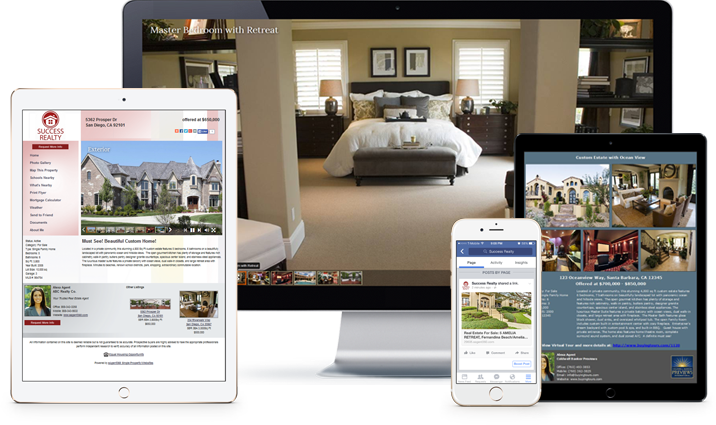 For each of one of your agent’s listings, our marketing engine automatically creates a property website, virtual tour, flyer, craigslist ad, and social media post. With Profusion360, you no longer have to use and manage different services from different companies. Not only will you save money using Profusion360 but you will save a lot of time using our integrated office platform with real estate office website, CRM, and listing marketing. Using different companies and trying to put it all together can be a major headache and will take lots of time that you don’t have. Let Profusion360 be your single provider for your real estate business to save you money and time, so you can focus on getting more clients. Our Team and Office Solution includes our powerful Listing Marketing engine. The Listing Marketing engine automatically generates a virtual tour, single property website, listing flyer, social media post, and more, for every one of your listings and your real estate agent’s listings. This will save you and your agents an incalculable amount of time. Because the Listing Marketing engine exists on the same platform as our Team and Office Solution, the two are seamlessly integrated. Want to generate leads for your real estate agents? Our Landing Pages Suite will turn your office platform into a lead generating machine. Profusion360’s Real Estate Landing Pages is the ONLY complete, effective, fast, and easy to use landing page solution. While others just address the design part of the landing page solution, we have the only complete lead generating solution. Our real estate landing pages integrate with your website and IDX so you can quickly create effective lead magnets for your landing pages. Easily define any type of homes lists and use them as your lead magnet for your landing pages for an effective lead generating strategy. Our real estate landing pages are also seamlessly integrated with our property websites. Use your property websites as lead magnets to promote your agent’s real estate listings. The leads generated from your real estate landing pages can be automatically evenly distributed to your real estate agents using our lead routing. Simply define a lead routing group and our system with distribute the leads to your real estate agents. 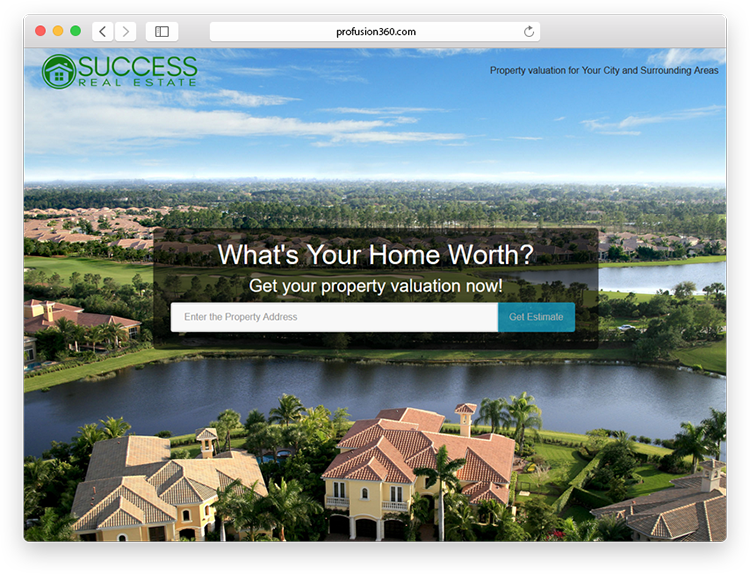 The Home Valuation Landing Page is included with all Office and Broker real estate websites. Our Home Valuation Landing Page captures all leads into our integrated CRM system and returns instant home valuations to the user. The Home Valuation Landing Page is integrated right into your Office and Broker website making it an effective method in capturing leads. Post the Home Valuation Landing Page on Facebook to capture even more leads. Our optional Office Showing Feedback System gives your real estate agents the platform they need to obtain feedback from the showings of their listings. Our Office Showing Feedback System is completely automated using our Lockbox Sync technology. 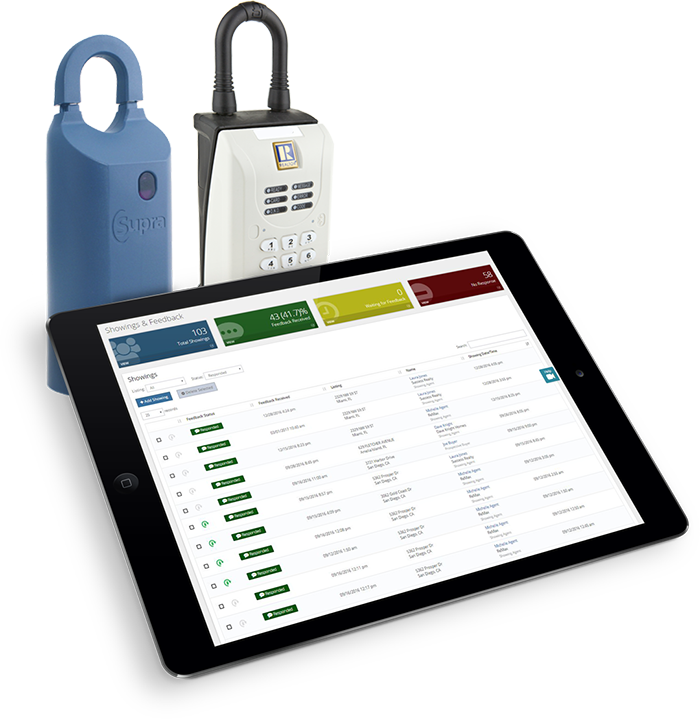 Our system will automatically capture all your showings from your Supra or Sentrilock lockboxes. We then email the showing agents a showing feedback questionnaire. Once a showing agent leaves feedback, we’ll notify you. 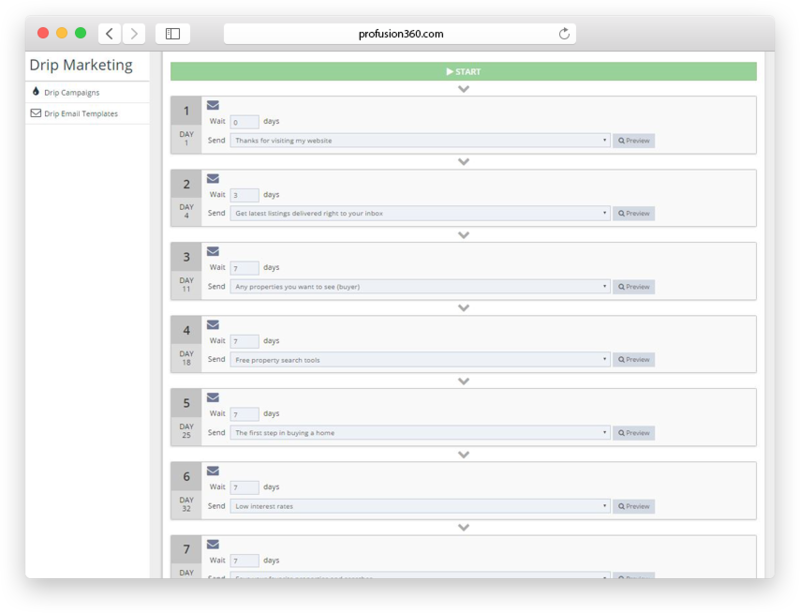 All of the showing feedback is compiled and stored in our system for easy and quick analysis. 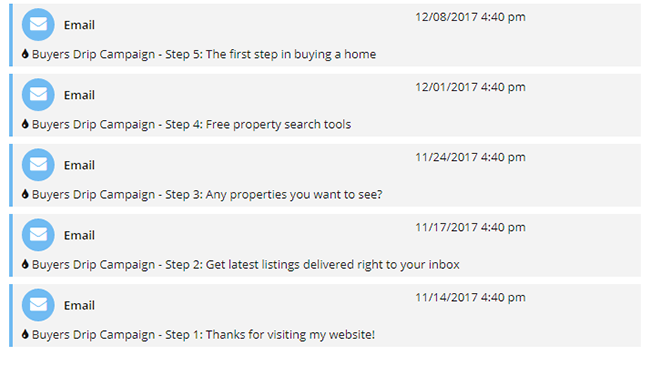 It’s a completely automated system that allows your real estate agents to obtain the showing feedback they need to sell their listings faster, and keep their sellers happy! Our Amazing Office Solution Starts at Only $180/mo! You won’t find an Office Solution with this many features at this price point. Questions about our Office Solution for Your Brokerage or Team?